Though 2-day RISC-V workshop has come to an end at IIT Madras, trust the magic of beginnings. 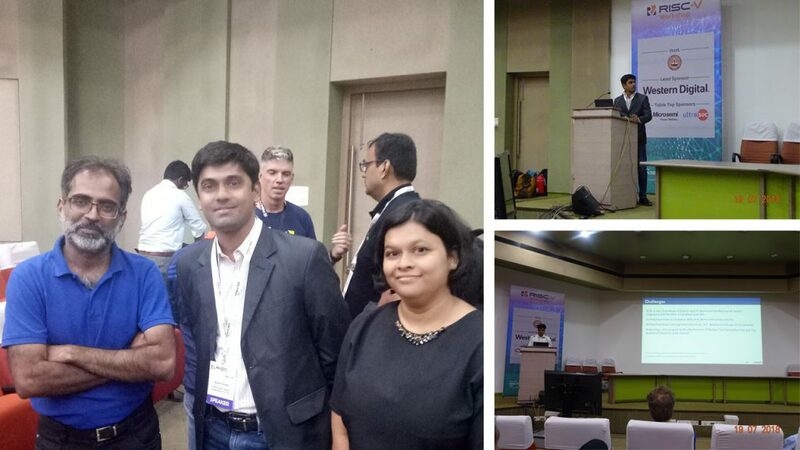 Not only, this workshop was a boost to RISC-V ecosystem, it was also a boost to Indian start-up ecosystem, where now, me and you, together can start a processor company, without much of legal hassles. ISA is opensource, many RISC-V cpu cores are available at gitbub and free to download, and on top of that, if I say, we are on the path, where you can now implement your core using opensource EDA tools…Wowww….That’s a new exciting never-seen-before model in semi-conductor industry. All you need is a push from within and think like an “entrepreneur” – By the way, that’s how Amazon, Facebook, Google and even Apple had started-up…. Next, Muhammad Arsath from IIT Madras presented his evaluation work on data-leaks on SHAKTI C-Class, which is a RISC-V based microprocessor. 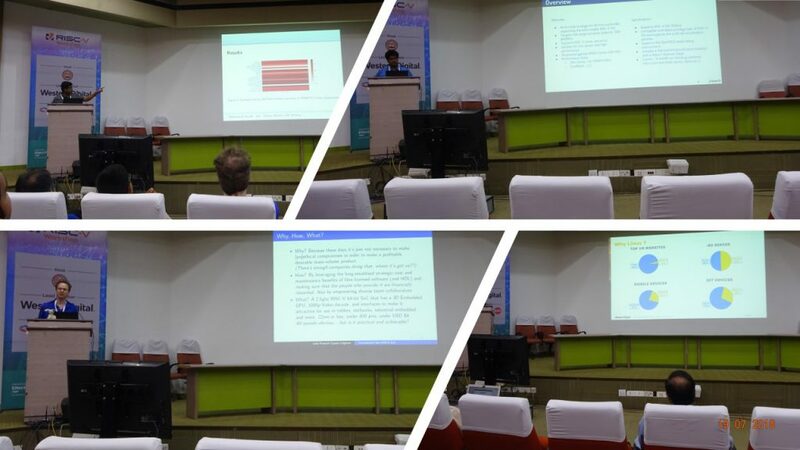 Vinod and Gopinath from IIT Madras described more about “Risecreek” (test SoC around SHAKTI-C64). “Risecreek” has been taped out using Intel 22nm technology node. Luke wrapped up pre-lunch talk on SHAKTI M-Class Libre RISC-V SoC, that outlined plan on how to design and bring to market a mass-volume commercial System-on-Chip. These talks did show the energy and excitement behind India’s RISC-V SoC ecosystem. To add to above, Paul George from IIT Madras presented Shakti Lockstep Verification Framework (SLSV) for dynamic verification and post-silicon validation. 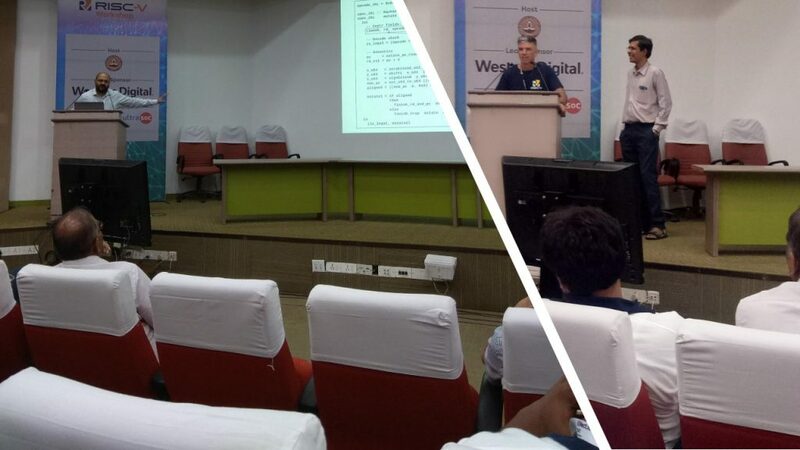 The good part – SLSV is completely open-source framework being developed at IIT Madras. Post-lunch, me and Anagha presented a unique paper, focusing on 2 main points – first, the power of open-source EDA tools, and its status on hierarchical front. Second, the power of technology mediated learning. Anagha, who is with me and Prof. Madhusudhan in above pic presented a unique problem, currently seen in the growing RISC-V ecosystem, i.e. “where to start”, “who will educate” and “who will empower” the young student community, who are the future.